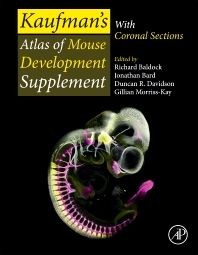 Kaufman's Atlas of Mouse Development: With Coronal Sections continues the stellar reputation of the original Atlas by providing updated, in-depth anatomical content and morphological views of organ systems.The publication offers written descriptions of the developmental origins of the organ systems alongside high-resolution images for needed visualization of developmental processes. Matt Kaufman himself has annotated the coronal images in the same clear, meticulous style of the original Atlas. Kaufman's Atlas of Mouse Development: With Coronal Sections follows the original Atlas as a continuation of the standard in the field for developmental biologists and researchers across biological and biomedical sciences studying mouse development. Researchers, graduate students in developmental biology, anatomy, neuroscience, and in all fields across biological and biomedical research.